You can decorate with books. I have books all over my apartment. They look great on bookshelves or you can be more inventive with your decorating (see a blog I did for author Emily March on this subject). The feeling of turning the pages of a book. Some eReaders brag that they replicate the “turning of a page” on the screen. I’m sorry, but if you think tapping a screen with your fingertip and seeing a page-turning graphic is the same as turning a physical book page then you are sorely mistaken. The smell of books. Embarrassing confession: sometimes I go through bookstores just to smell the books. If you’ve never done this, I highly suggest you try it, though preferably when no one’s watching. It’s a little awkward when you bury your face into a nice fragrant book only to look up and see people shooting apprehensive glances your way… not that this has happened to me. You can borrow/lend out physical books. I love sharing good books I’ve read with my friends and family (although if you dog-ear the pages in my books I will come after you). My sister’s not as big a reader as me but I sometimes slip a book into a bag of movies she wants to borrow or “forget” a book at her apartment in the hopes that she’ll pick it up and read it. You cannot do this on an eReader. They tell stories of their own. This is especially true of used books. When you buy a physical book from a used bookstore you inherit a piece of it’s previous owner’s history. The books tells a story not just in the words on its pages, but in the handwritten notes in the margins or the folds in the pages where another reader paused to reflect. An eReader becomes outdated every few years and is replaced by a newer version but a physical books stands the tests of time and may be read by generations of readers in its lifetime. I’m not saying I will never own an eReader in the future–today more and more authors are opting for the eBook option because it’s cheaper than traditional publishing and because that’s the way publishing seems to be headed. However, I will say that I will never stop buying physical books. There’s a magic to them that you just don’t get from the screen of an eReader and I hope to preserve a bit of that magic and pass it on to those around me. 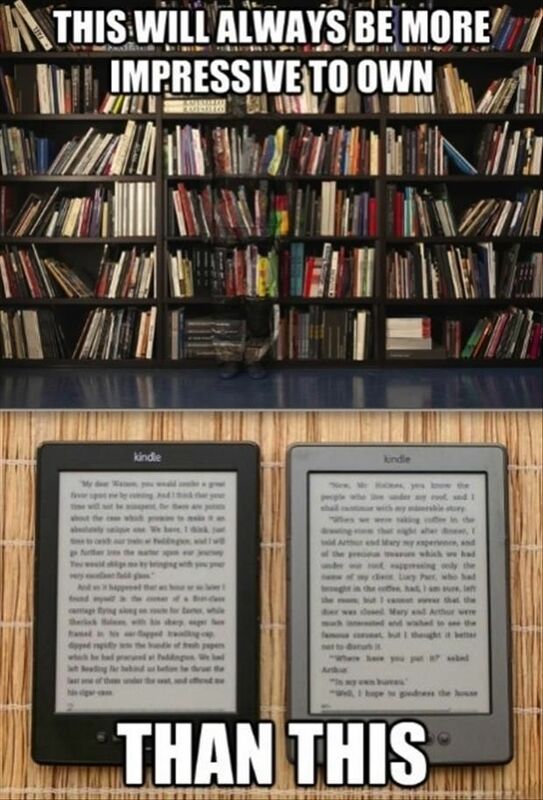 Do you own an eReader and if so, do you own physical books as well? Which do you prefer?